I will take suggestions for new beads, the colors you like or the auction # of a particular bead if you would like me to recreate it. I will also take size suggestions as some people like the bigger beads and some people like the smaller beads. However, a fully loaded bead with triple layer petaled flowers with three butterflies and everything else that is put in there is sometimes hard to get to 14 or 15 and usually run 16mm. 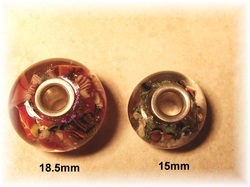 I really need to do an article on bead sizes as so many people have no idea the mm of the pandora or other store bought beads - I think they run 13mm to 15 mm in diameter and around 7.5mm wide, but have only owned one troll glass bead to date. A 15mm bead on a regular ruler will run just over 1/2 inch in diameter and an 18.5mm bead will run 5/8 inch. A 16 - 17 mm bead will generally make a great focal bead on a bracelet or Necklace. The really depends on the person as I have known some people to collect all larger beads. They stated they could see the actual designs better on the larger beads. Most people upon first discovering Artisan beads don't pay to much attention to the bead size, until they get it in the mail and find out what a 17mm bead looks like on their bracelet. I try to offer beads that range from 13mm all the way up to 18 or 19 mm, so please pay attention to the bead size to get the perfect size for you! I can unfortunately only make so many beads per week. Each bead with encased flowers and murrini designs can take from 1 to 1 1/2 hours to make, then there is the kiln annealling 7 - 10 hours, bead cleaning and sterling coring process. To receive notification of new beads listed please sign up for my newsletter.